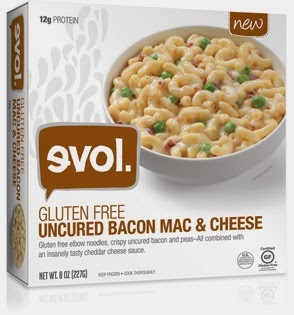 Ollie Ollie Toxin Free: Review: EVOL Smoked Gouda Mac and Cheese (GF) — Ah-mazing. 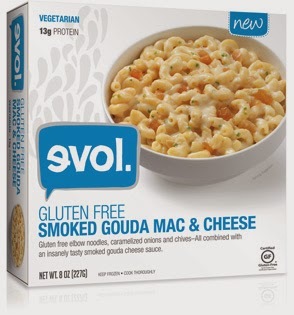 Review: EVOL Smoked Gouda Mac and Cheese (GF) — Ah-mazing. Admit it, sometimes you need to grab food that is pre-made. All the best planning in the world cannot predict life's little surprises (or laziness). My friends, I have a great option for you. I mean, that is if you eat dairy and love small doses of comfort food. I spied EVOL Smoked Gouda Gluten-Free Mac and Cheese at Target in the frozen aisle and just had to try it. I am a complete sucker for mac and cheese. And making it from scratch with GF pasta is a crapshoot. It seems that most pasta I try ends up with a less-than-ideal consistency. Now, by the LOVE of EVOL (see that? ), I can pop a single-serving of bliss into the microwave (or oven if you prefer) and 4 minutes later have a quick meal. A cheesy, tasty, perfect lunch or snack. Here's how they describe it on their site: "Gluten-free elbow noodles, caramelized onions and chives—All combined with an insanely tasty smoked gouda cheese sauce." Accurate. Like bacon? You're in luck. They make Gluten-Free Uncured Bacon Mac & Cheese touted as "Gluten-free elbow noodles, crispy uncured bacon and peas—All combined with an insanely tasty cheddar cheese sauce." Again, deliciously on the mark. Try some of their frozen entrees, quesadillas, pastas, burritos...and come back to tell me if you're as in evol as I am!